I haven't done this in awhile. So I thought since I've had some good news this week I needed to celebrate. 1. My dad has had 2 days of improvements. I don't know how his Broncoscopy went today. It is his third and I don't think his lung dr was happy about doing another one, but yesterdays blood gas test and his Xray showed some improvement. He's still on a Vent but everyday we cherish the small improvements. I fully believe this is from all the prayers. Thanks to everyone who has stopped to pray for him. 2. Yesterday was Emmy's bday. I finally let her in to see dad and she told him she was there and that was about it. Its still scary for all of us so I can imagine its scary for them too. 4. I bought some new tennis shoes. I have decided that once dad is out of the hospital that I will start a couch to 5k program. I have become too sedentary and I hate that. 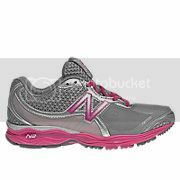 They are cute Grey and hot pink New Balance. I should add I usually hate tennis shoes. I gave a pair away when I moved because I had them since before my oldest child was born (the child about to be a teenager) But these are super comfy. 5. I just realized that FB has a notes section. I am sure I must have known this once upon a time because I found about 20 notes that were hysterical. I think I just found blog material to last me a while.